When I bought a new computer a few months ago, I also purchased a replacement for my ten year old monitor. Although the colors on my old monitor are very inaccurate due to age, it has no other problems so I decided to keep using it in a two-monitor setup. While it is great that I have twice as much screen space, I lost a lot of physical desk space. Which means that I no longer have enough room for my desk lamp. 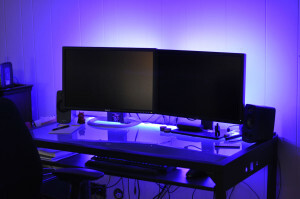 So I began to search for an alternative desk lighting solution and found a way to create custom lights using LED strips. The interesting thing about LED strips is that you buy them in a large roll (usually up to 5 meters in length). Then you can cut them to whatever size you want, at marked two-inch intervals, and wire them together as needed. So I bought some inexpensive multi-color LEDs from Amazon, which included a power block and a remote for controlling the lights. I also had to make a few local purchases for wire and additional connectors. Then I soldered together the LED strips in the general shape and size of the back of my two monitors. Finally, to add a little extra light (and make my desk look cooler), I added a strip of LEDs to the back of my frosted-glass desktop, so the light diffuses through the desk. The picture below shows the result. I normally have the light set to a warm-white setting, but for the picture I set it to a deep blue. I can choose between about twenty different colors, which is mainly nice because I can choose which shade of white light to use (pure white from a LED is pretty stark — I prefer a warmer light, especially at night). Just in case I decide to have a dance party in my office, I can also turn on various strobe effects, but I doubt I’ll ever need those. My new LED desk lights, set to blue. Click to view full size image.